Santikaro Bhikkhu is an American-born monk who has been living in Thailand at the Suan Mokh monas­tery for twenty years. His teacher was Ajahn Buddhadasā, a well-known scholar and practitioner who contributed greatly to the development of En­gaged Buddhism through his writing and teaching. These pages are extracted from a seven-day Bhāvana Program at the Barre Center for Buddhist Studies that took place in March 2000. The Pali word bojjhaṅgā is usually translated as “factors of en­lightenment,” and I too have been using that word out of habit. But I really prefer the term “awakening” to “enlightenment.” This Pali word has two parts: the first part “bojjh” comes from the word “bodhi,” based on the root “bodh,” which means “to wake up.” Bodhi literally means “awakening,” and “Buddha” is thus “an awakened one.” I try to stay away from the word “enlightenment” because of it’s cultural connections in western history. The Enlightenment was a very rationalistic enterprise, and I think we got stuck with the word “enlightenment” in Buddhist circles in part because the first Western translators were scholarly rationalistic types who read Buddhist literature from that perspective. The early scholars did not pay much attention to Buddhism as a system of meditation. The second part of the word bojjhaṅgā is “anga,” which literally means “limb” or “member.” This word is used in various ways in the Pali suttas [discourses], often, as in this case, in the sense of a factor or component of something. When the number seven (satta) is added as a prefix to bojjhaṅgā, or to its longer designation “sambojjhaṅgā,” we get the phrase “seven factors of awakening” or “seven components of awakening.” The idea is that the seven components are not separate things. They go together as a unitary whole. I would like to begin by talking about how the seven factors interact. In doing so, I’ll rely quite a bit on the Ānāpānasati Sutta [the Mindfulness of Breathing Discourse: Majjhima Nikāya 118], because these factors of awakening are not mere theoretical is­sues; they have to do with our practice, and particularly with the breath-based approach to practice outlined in that sutta. When we look at these factors closely in our own experience, we can clearly see how each one supports and naturally gives rise to the next. When the meditator gets in close and contemplates with a well-established mind-in that moment, all the seven factors or bojjhaṅgā are arising together. They happen all together at the same time, not separately, and not one leading to the other in a sequence. The perspective I take on using these seven factors of enlight­enment as a path is to learn how to use them in everyday life. In my understanding of Dhamma – and I hope you share this perspective – to work with these factors only within the context of formal meditation is to limit ourselves, limit the dhamma, and limit medi­tation. This is not to belittle formal practice; indeed there is a special and important role for our sitting practice, our walking prac­tice, as well our eating and study practices; but my hope is that we learn how to move back and forth effortlessly between these formal practices and the everyday living of life. –ardent, fully aware, and mindful, having put away covetousness and grief for the world–on that occasion unremitting mindfulness is established in him. Abiding thus mindful, he investigates and examines that state with wisdom and embarks upon a full inquiry into it. In one who investigates and examines that state with wisdom and embarks upon a full inquiry into it, tireless energy is aroused. In one who has aroused energy, unworldly rapture arises. In one who is rapturous, the body and the mind become tranquil. In one whose body is tranquil and who feels pleasure, the mind becomes concentrated. He closely looks on with equanimity at the mind thus concentrated. This is how the four foundations of mindfulness, developed and cultivated, fulfil the seven enlightenment factors. Excerpted from the Ñāṇamoli and Bodhi translation: The Middle Length Discourses of the Buddha (Shambhala 1995) p. 946-7. The first of the bojjhaṅgā is sati, which is usually translated as “mindfulness.” But some, like Thich Naht Hahn, translate it as “awareness” or “full awareness.” The Thai word for mindfulness is “reluk,” which means to recall, to keep coming back. Etymologi­cally, sati is rooted in the word for memory, and in some contexts it can simply mean memory. But sati as mindfulness means to come back to the present, while memory is more about the past. Mindfulness also means confronting whatever arises in our experi­ence; getting in there close and really look­ing at what is there. When we practice in this way, being mindful and clearly aware, without striving to remove or embrace anything, or to aban­don liking and disliking towards the world, that’s really all there is to practice. When we practice the four foundations of mindful­ness in a correct way—and it must be stressed that they need to be correct—then all the dhammas of Buddhism will be right here, and then it will be easy for the factors of awakening to arise and persist. When mind­fulness and clear awareness (sampajañña) are complete, it is an antidote to the interplay of liking and disliking, covetousness and aver­sion towards the world. When mindfulness exists to this extent, that is the mindfulness factor of awakening. These are not two different topics. We don’t have to go and practice something else for there to be the mindfulness factor of awak­ening. It’s really quite simple. All we have to do is note the long breath as long breath and the short breath as short. Just practic­ing on this basic level is the beginning of the mindfulness of awakening. When we are able to note the long or short breathing with sufficient mindfulness, then we are aware or mindful of the long breathing for the entirety of the inhalation or exhalation. Otherwise it would run away from us, which is to say that mindfulness will be broken and the mind will be think­ing about various things. But as soon as we get down to this basic level of practice, even on the very first lesson of the sixteen steps as outlined in the Ānāpānasati Sutta, then the mindfulness factor of awakening has be­gun to develop. When mindfulness is thus really en­gaged, then we have the capacity or the op­portunity for the second factor of awaken­ing: investigation of dhammas or dhamma-vicaya. Vicaya means to investigate, to scru­tinize or to analyze. We can take this to mean an intellectual analysis, or we can re­gard it in a more meditative context as a non-intellectual scrutiny. Depending on how we regard the analysis, the word dhamma here can mean something as precise as a very particular mental state, or can more broadly mean anything of significance in our lives. When mindfulness has become well es­tablished, then that mindfulness can take up part of the experience and investigate it; to select, take it up, and scrutinize it. I like to think of the image of a jeweler working with precision. You see these guys with their little monocles to which they hold up a jewel, and they look at it very carefully. They ex­amine its color, texture, clarity and shape. They examine it for flaws of various kinds. And they don’t just hold it up; they turn it around and see how it looks in the light, from different angles, and so on. This whole examination is very active; there’s partici­pation; it’s dynamic; it’s engaged. As it is described in the Ānāpānasati Sutta, the meditator “investigates and examines that state with wisdom and embarks upon a full inquiry into it.” This is the quality of inves­tigation that emerges naturally from mind­fulness as the second factor of awakening. With mindfulness of breathing, what matters is that the mind is attentive—it is closely aware of in-breathing and out—breathing. And investigation is slightly dif­ferent than merely noting. In noting prac­tice we might notice that “there goes a thought, there goes a feeling” and so on. There’s a degree of mindfulness in this, but it might lack that quality of investigating called for in the second factor of awakening. It is important to notice what goes through the mind, but it is also helpful to examine the effect those things are having. Most teachers speak of mindfulness in a way that it includes some kind of investigation. Whether you talk about it as two things or one, what matters is that investigation is taking place. That’s conscious practice. 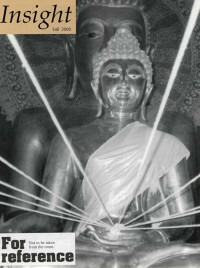 Ajahn Buddhadāsa always stressed a broad understanding of the word dhamma in the phrase dhammavicaya. Since dhammas are practically infinite, one could spend one’s whole life chasing after insignificant little quirks in detail and call that practice. But Ajahn Buddhadāsa emphasized that there are a lot of dhammas that aren’t so necessary for us to spend our time on. For instance, just sitting and watching ev­erything that arises in the mind may be too broad, and a little bit fuzzy. It is true that to be able to watch what arises in the mind, to just see it arise and pass away, is good mind­fulness practice. But out of the endless stream of what arises and passes away, there are some phenomena that are problematic and need more primary attention. The Buddha used different perspectives throughout the suttas to delineate what needs greater attention. A common pair of terms is “kusala” and “akusala‘ – wholesome and unwholesome; skillful and unskillful. Kusa is a kind of grass with sharp edges and it also means to cut. Kusala is to cut through the cravings, the attachments, the ego iden­tities, the defilements that keep us spinning around in suffering. Akusala is to not cut, or to cut the wrong stuff. Kusala is to develop what’s healthy such as tolerance, mettā/kindness, karunā/compassion, and all the wholesome stuff, and akusala is the oppo­site of all that. So when investigating, you can use this simple idea of observing the stuff that arises: is it wholesome or unwholesome? Is it stuff that keeps us enmeshed in suffering, or does it offer support in getting free of suffering? Does it support letting go of our egoistic ten­dencies and so on? When we investigate dhammas, it is primarily the investigation of those dhammas that are still problematic in our lives, such as fear, doubt, anxiety, re­sentment, pride, all those things that keep us trapped. Or we investigate healthy dhammas, the healthy spiritual qualities, the healthy emotions or healthy mental states in order to strengthen them, to allow them to awaken us. Being skillful in practice—employing upaya, or skillful means—means honing in on the qualities that are significant in our lives. Often these are the things connected with suffering, with dukkha. Skillful prac­tice involves investigating things like our favorite forms of clinging, because that’s di­rectly creating suffering for ourselves and for others. Also investigating our opinions, emotions, desires, identities, defense mechanisms – these are things directly related to suffering and are the most important to investigate. If, for example, there is not much openness or flexibility in our lives, or we’re not so good at forgiving, or at generosity, tolerance, patience; if any of these qualities or wholesome dhammas are weak or ab­sent or inconsistent, then that is something to investigate. The flip side of that investigation are those virtues and spiritual quali­ties that are absent or weak, which is an­other way of talking about suffering. Question: Doesn’t the sort of investi­gation you are describing from our experience into conceptual think­ing? It can be intellectual, where we get in there with the rational mind and analyze things and look at it from different angles. And one has to be careful about getting locked in to any one intellectual or rational position. But in the broader sense of the word, while there’s room for intellectual in­vestigation, there’s also the implication of a more subtle form of investigation, which I think is more central to meditation. And here we are not using the intellect so much. The intellect, I feel, is very good for rais­ing questions, for framing questions, and for directing attention to things. But the actual investigation of things, l think, goes beyond intellect. Often to get to the nonverbal we need to do some thinking, so at an earlier stage thinking might play a helpful role. Thinking brings our attention to what’s ac­tually happening, and then the conceptual part loses it’s importance. But a lot of it comes back to experience and skillful means. You learn your own mind and you learn to work with what works. There are times when some clear thinking is needed, and some­times to not think is even irresponsible. Ajahn Buddhadāsa once told me in a con­versation that his practice was guided by the intellect. He was considered a scholar and a thinker, but at the same time he was a practitioner. A lot of his scholarly work was to sort out what was important and where to put his attention. And once you’ve used the intellect to guide one’s attention, then the practice is to look at the deeper level, to look into things carefully, to exam­ine them deeply and so on. Investigation of the wholesomeness or unwholesomeness of what’s happening in the mind can be on a verbal level, like re­flection; but once the mind gets well-trained we can drop the words, and it becomes a more intimate, non-verbal scrutiny. As a learning method, we can inquire into the nature of our experience from time to time until one sort of gets used to paying atten­tion to things in that way. Later it may be­come more of a habit. In the case of the jeweler mentioned earlier, I don’t think he actually has to “think about” what he is do­ing when examining a gem. His training has become a part of his way of looking at things, and then the examination and the looking are not two different things. We use whatever tools will help us look at experience in a way that reveals its hid­den aspects. It can be something very simple like: Is this suffering or not suffering? Is it wholesome or not wholesome? This kind of questioning is not a judgment. The suttas don’t actually give you a detailed list of what is unwholesome, but encourage you to look at it and see how it’s unwholesome, why it’s there, where it comes from. This is the process of investigation. How does this process of investigation work in daily life practice? Charles Tart, a well-known researcher and writer on con­sciousness, uses the term “consensus trance.” I find this a useful term, because it expresses the world in which we spend a lot of our time. It’s a trance because we’re kind of lost in it without really knowing what we’re doing, what we are, what’s going on. And it’s a consensus because we create it with others through language, through shared culture, through education and the media. We create a whole package of be­liefs, assumptions, expectations, values, theo­ries, dogmas, “isms,” which are generally as­sumed and not much examined. Yet certain aspects of this cultural con­struction of reality can be examined through investigation. I have friends who are Marx­ists, and they use Marxist analysis to look at the class aspect of the consensus trance, and maybe, at least in terms of class, they start to step out of the trance a little, or feminists will look at it from gender perspectives, and reveal the hidden ways our thinking is molded by consensus. Psychologists will look at the trance in terms of certain psy­chological theories, and so on. It’s my understanding that dhamma in­vestigation involves starting to look at the assumptions, the beliefs, the theories, the dogmas, the ideologies that we to some de­gree carry within us, perhaps unconsciously. It is possible to do a lot of meditation, espe­cially in retreat situations, where one has experiences that are vivid, clear and profound when they happen. But before long we can get plugged right back in to the old intellec­tual structures we’ve grown up with; what we learned in school, what we were trained in at a university or in a job. It could be a political ideology, a cultural bias, a personal­ity quirk or anything else that has created the structure of view, beliefs and ideas we live with. I believe it’s important to spend part of our time investigating these cultural assumptions, beliefs and biases, and to let our meditation practice liberate us from these kinds of things—issues of racism, patri­archy, sexism, just to name a few. I’ve been lucky, I think, in this regard because I grew up in one country, and about the time I was becoming an adult (if that ever happened, and I have my doubts) I went to a much different culture where some of the beliefs and assumptions were different than the ones I grew up with. So I’ve spent a lot of my life with a certain amount of dis­sonance between my assumptions and what was going on around me. And then after living in Thailand for some 20 years now, coming back to the States periodically, that dissonance continues, which is kind of fun. It keeps me on my toes. Some of the Pali suttas from the Buddha’s time give examples of the kind of fixed views that philosophers and religious people were forming. While the terminology of these views may be strange to our modern ears, the meaning is still contemporary, and it may even turn out we too have fixed views on matters that were discussed in Buddha’s time: “Is the universe infinite or finite?” This is a current debate in cosmology, phrased as whether the universe will continue expand­ing endlessly or eventually contract. Or “Are the soul and the body the same or are they different?” This is an ongoing debate in cognitive science, having to do with the nature of consciousness and the mind/body rela­tionship. But if we can see that these are only constructs of mind, that these are outside of our own experience, that we have created them collectively, then we don’t have to cling to them. Views are fixed when you think the content of the view is something that is lasting, permanent and true. But if you see it as just an idea that’s created in one person’s mind, or in a group, and has been passed from generation to generation, then it’s hard to cling to it in a fixed way. How many opinions do we have that we’re still clinging to because we haven’t yet seen that they are created opinions? This is a matter to be investigated. The Buddha talked about “right view” as seeing the truth of something without cling­ing to it. We can see just by careful looking and investigation that dhammas are imper­manent, unsatisfactory and empty of all con­ditions. But this kind of right view is dis­tinctly different from creating a philosophical system based on a view and then feeling you’re superior to people who don’t share those perspectives. Some Buddhists have been known to cling to the notion of non­attachment, and then use it to criticize oth­ers. Or you might hear that to be a Buddhist you have to have certain views. One writer has stated recently that if you don’t believe in rebirth, you can’t be a Buddhist. When we look at the enterprise of in­vestigating views from the practice perspec­tive of the Ānāpānasati Sutta, we see that the emphasis is on impermanence and let­ting go. The point here is that whatever we’re mindful of, whether factors of the path, the five faculties, the five powers—or all the other items listed in this sutta—we should be seeing the impermanence of whatever is being experienced, seeing its instability, see­ing the fact that whatever is arising is de­pendent on other things. Therefore it has no inherent existence of its own. There’s only the interdependence, the selflessness, the emptiness of everything. Much of Ajahn Buddhadāsa’s teaching involved applying the teachings to ordinary life. His thesis was that the point of being a Buddhist is to live without suffering, and not just out in some cave or on meditation retreat or in the monastery, but in the midst of whatever we’re doing. And the way to live without suffering is to transform whatever we’re doing—whether plowing the rice fields, brushing your teeth, doing the dishes—into a practice of the path. He was grounded in his environment, so he would often talk about the seven factors of awakening in very colloquial terms. First of all, you have to be very aware of what you are doing. You have to be mindful of your buffalo and you have to be mindful of the plow. If the plow goes too deep it gets stuck; if it’s too shallow, it doesn’t do any good. You have to be mindful of where to turn, of what signals you are giving the buffalo, and a host of other factors. And not only mindful, but you need to be constantly investigating while you are plowing the field with the water buffalo. The mind has to be alert in checking things out as you go: examining the quality of the soil, the level of moisture, the state of the buffalo, the location of obstacles. You have to be learning in the process. You have to put effort into it—both physical and mental effort. Without effort you may space out and get lax. If your buffalo is a good one he may just keep going for a while; but some buffaloes are naughty, as are horses and mules, and if they discern any slackness in your hold, they’ll take advantage of it. You also need a certain amount of satisfaction in what you’re doing. Whether we’re plowing a field or practicing meditation, anything can be boring or burdensome if we don’t find satisfaction in it. Or it can be fun, in a dhammic sense—interesting, rewarding. We are better able to pursue what we find satisfying in a wholesome way. And this satisfaction will bring with it a state of calm, if we’re plowing our field, but we’re agitated physically, we’ll annoy or startle the buffalo, if our mind’s agitated, it’ll interfere with some of the other factors, it is easier to be present, whether plowing the field or doing meditation practice, when calm. When the mind settles down, it naturally becomes more focused. The forces that agitate and distract the mind become eliminated, and it is easier for the mind to remain settled upon a single task. Both the farmer and the buffalo need to be undistracted if the field is the get plowed before dark. When all these factors are present—and they mutually reinforce one another—the mind gains the ability to just watch over and keep things on track. The effort becomes effortless, so to speak. Equanimity is like that—when you’re completely in balance and yet you have some momentum. You don’t make mistakes, and the work just appears to move forward on its own. This is how the seven bojjhaṇgā can work together to turn any activity of daily life into a rewarding practice of progressing on the path of awakening.